Michael Shaara (June 23, 1928 – May 5, 1988) was an American author of science fiction, sports fiction, and historical fiction. His novel about the Battle of Gettysburg, The Killer Angels, won the Pulitzer Prize for Fiction during 1975. Shaara died of a heart failure in 1988. They are volunteers, last of the great volunteer armies, for the draft is beginning that summer in the North. They have lost faith in their leaders but not in themselves. They are volunteers: last of the great volunteer armies, for the draft is beginning that summer in the North. They have lost faith in their leaders but not in themselves. Generals can do anything. Nothing quite so much like God on earth as a general on a battlefield. "General Meade has his son as adjutant." "That's different. Generals can do anything. Nothing quite so much like God on earth as a general on a battlefield." But he was fighting for the dignity of man and in that way he was fighting for himself. If men were equal in America, all these former Poles and English and Czechs and lacks, then they were equal everywhere, and there was really no such thing as a foreigner; there were only free men and slaves. And so it was not even patriotism but a new faith. The Frenchman may fight for France, but the American fights for mankind, for freedom; for the people, not the land. Some of us volunteered to fight for Union. Some came mainly because we were bored at home and this looked like it might be fun. Some came because we were ashamed not to. Many of us came... because it was the right thing to do. "Here we judge you by what you do, not by who your father was. Here you can be something. Here's a place to build a home. It isn't the land-there's always more land. it's the idea that we all have value, you and me, we're worth something more than the dirt. I never saw dirt I'd die for, but I'm not asking you to come join us and fight for dirt. What we're all fighting for, in the end, is each other." "It is unbecoming to a soldier, all this book-learning." "A Holy War," Longstreet said. He shook his head. He did not think much of the Cause. He was a professional: the Cause was Victory. It came to him in the night sometimes with a sudden appalling shock that the boys he was fighting were boys he had grown up with. The war had come as a nightmare in which you chose your nightmare side. Once chosen, you put your head down and went on to win. "I've been thinking on your theories of defensive war, and look, Pete, if you don't mind the opinion of an aging military genius, just this once? Technically, by God, you're probably right. Hell, you're undoubtable right. This may be a time for defensive war. But, Pete, this aint the army for it. We aren't bred for the defense." "I don't know what else we could have done. Sir, I'm sorry. 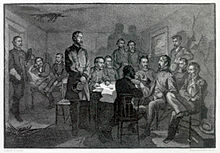 But it started out as a minor scrap with a few militia and the next thing I know I'm tangling with half the Union Army." But the men marched believing they were behind McClellan. He was the only general Chamberlain had ever seen who was truly loved. The Rebs loved Lee, no doubt of that. And we loved Mac. Chamberlain thought: Two things an officer must do, to lead men. This from old Ames, who never cared about love: You must care for your men's welfare. You must show physical courage. Honor without intelligence is a disaster. Honor could lose the war. Just put one man behind a tree. You can hardly see him from two hundred yards away, but he can see you. And shoot. And shoot again. How many men do you think it will take to get to that man behind the tree, in a ditch, defended by cannon, if you have to cross an open field to get him? How many men? Well, I've figured it. At least three. And he'll kill at least two. That night, at supper, someone remarked casually that since the army needed ammunition, wouldn't it be proper for the ammunition factory to stay open on Sunday? Most of the officers agreed that it had not yet come to that. One thing I'm very glad to see. 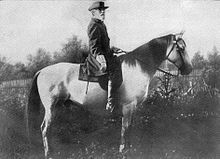 Your General Lee is a moralist, as are all true gentlemen, of course, but he respects minor vice, harmless vice, when he finds it in others. Now that's the mark of a true gentlemen. That is what distinguishes the man so to me, aside from his military prowess, of course. The true gentlemen has no vices, but he allows you your own. They say that General Lee was asleep, and the army was marching by, and fifteen thousand men went by on tiptoe so as not to wake him. Oh, by the way, there's a story going around, do you know? They say that General Lee was asleep, and the army was marching by, and fifteen thousand men went by on tiptoe so as not to wake him. Men cannot be threatened into the kind of fight they will have to put up to win. They will have to be led. He moved closer to the wall up there, past mounds of bodies, no line any more, just men moving forward at different speeds, stopping to fire, stopping to die, drifting back like leaves blown from the fire ahead. "It's no good trying to get yourself killed, General. The Lord will come for you in His own time." "If the war goes on-and it will, it will-what else can we do but go on? It is the same question forever, what else can we do? If they fight, we will fight with them. And does it matter after all who wins? Was that ever really the question? Will God ask that question, in the end?" I was trying to warn you. But... you have no Cause. You and I, we have no Cause. We have only the army. But if a soldier fights only for soldiers, he cannot ever win. It is only the soldiers who die. He had forgotten the Cause. When the guns began firing he had forgotten it completely. This page was last edited on 15 November 2018, at 23:23.